The Graveyard Survey was carried out between 2013 and 2016 by volunteers and by pupils from local schools. 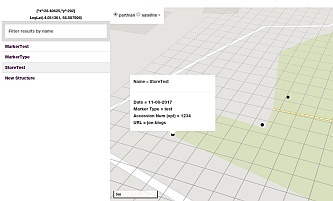 The first part of the survey took place 20 – 23 August 2013. 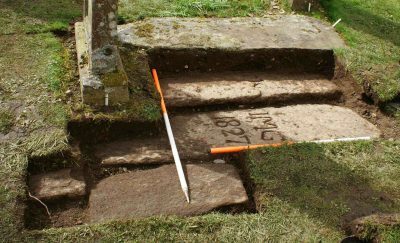 A team of volunteers, led by Clare Thomas, and including Cindy Brook, Neil and Rosie Hooper, Gordon Stark, Andrew Walker, Fran Donovan, Flora Davidson and Eva Bennet began to plot and record the visible tombstones. Part of the team began to record individual tombstones, using the Scottish Graveyard Survey’s form. The others started to draw up a plan, using the offset method. By the end of the week, all visible stones had been plotted. Work resumed 7 – 11 April 2014, this time probing for stones buried up to 15cm deep. 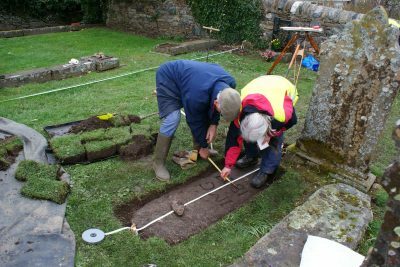 The guidelines of the Moray Burial Group were followed. All buried stones were given the prefix ‘U’. The first ‘find’ was not a tombstone but a double paving slab. This was followed by a close concentration of horizontal tombstones in the vicinity of B109 and B128. Two further weeks of survey were carried out in August 2014 and 2015, with the help of pupils from Breadalbane Academy and Pitlochry High School. Pupils helped with probing, uncovering buried stones, and with recording both buried and visible stones. A quiz was also drawn up, to encourage them to study both church and churchyard thoroughly. The last part of the survey took place in August 2016. A total of 21 buried stones were found, including probably 19 tombstones. Some of these were plain, a few had initials carved on them, or a date; one had a representation of a plough. 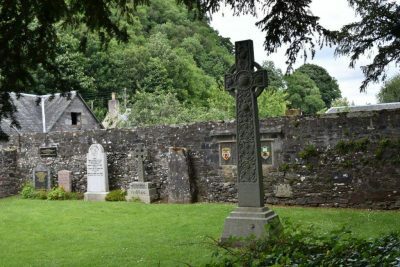 All the information on each gravestone was recorded on a Council for Scottish Archaeology form and coded to link it to the location on the graveyard plan produced in the survey. In many cases sketches of the inscriptions were included on the forms. Photographs were taken of the stones. 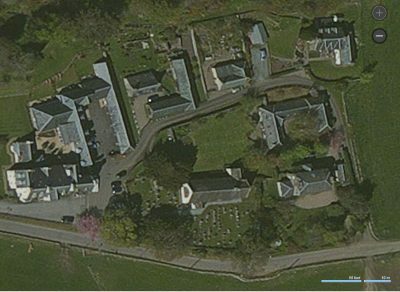 All this information is now being linked on a web-based map to make it readily accessible to anyone interested in the Fortingall graveyard.